This year I bought around 12 boxes of Girl Scout cookies, from various family and friends. Most of them were samoas and thinmints, as those are my favorites, and even though I was able to devour a few boxes by myself, there were still plenty left over. That's when I decided I would make ice cream with them. 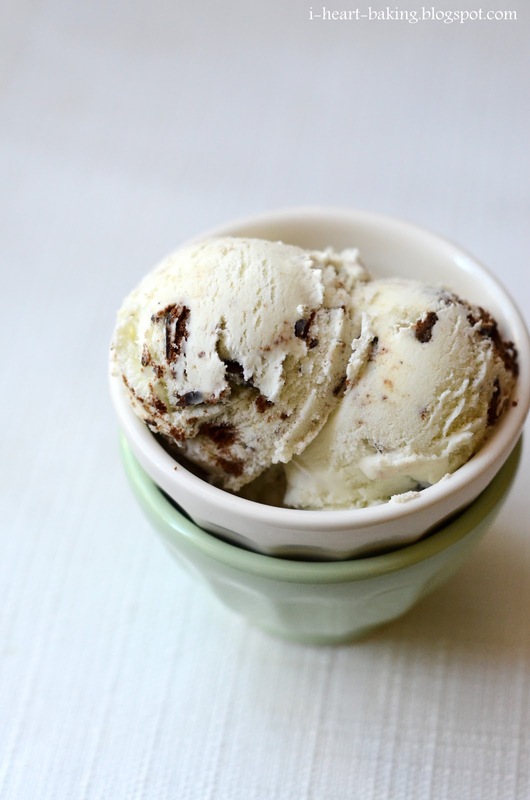 My friend Diana's husband and their daughter love mint chip ice cream, so when one weekend we decided to get together and play, I made them mint thinmint ice cream. I turned to my copy of David Lebovitz's "The Perfect Scoop" for a mint ice cream recipe, although at the time, I didn't have any fresh mint on hand, so I used peppermint extract instead (plus a few drops of green coloring). After churning the ice cream for about 25 minutes, I added a cup of chopped thinmint cookies. Then I let it it churn for a few minutes after, to incorporate the cookie bits, and then poured the soft ice cream into a container and let it sit in the freezer overnight. The next day we all met for lunch, and after a big meal of delicious burgers and fries, we had our ice cream! Perfect and refreshing for a big burger meal! A week later I made another batch of the same ice cream, this time using fresh mint from our garden (turns out we had mint after all!) 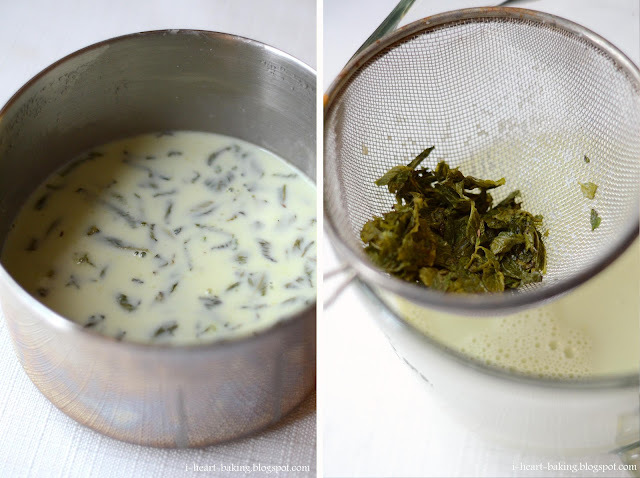 This time I heated milk and cream on the stove, and then soaked the fresh mint in it for about an hour (after the heat was turned off). When I went back to check on it, the milk and cream mixture had turned a beautiful shade of green! Then the rest of the steps were the same with the churning and the addition of chopped thinmint cookies at the end. When I tasted the fresh mint version, it tasted really fresh and clean. But it wasn't the same "mint" flavor as you'd expect from mint ice cream. This was more of a "mojito" mint flavor, minus the lime. But it was still good. Next time I'll look for fresh peppermint leaves, and try it with that instead! OMG! I love mint ice cream and on top of that girl scout thin mints! Oh Yeah! 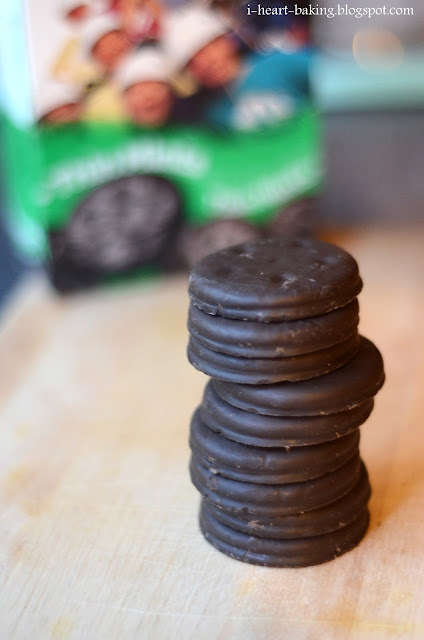 YUUUUUMMMMMM....pinning this for next girl scout cookie season!! @Mrs. iHB @ iheartbudgets - awesome! :) thanks for pinning it!